*For the smoothest filling — yes, you DO have to sift the cocoa and sugar. If a few lumps don't bother you, never mind the sifting. *For extra-chocolate-y icing, substitute 1/2 cup confectioners' sugar + 1/4 cup Dutch-process cocoa powder, sifted together, for the 3/4 cup confectioners' sugar called for. Preheat the oven to 350°F. Lightly grease a 9" x 13" cake pan; or line with parchment, and grease the parchment. 1) To make the cake: Melt the butter, and stir in the cocoa and hot water. 2) In a separate bowl, combine the flour, espresso powder, sugar, soda and salt. 3) Pour the cocoa mixture over the dry ingredients, stirring to blend. 4) Beat in the buttermilk or yogurt, eggs and vanilla. 5) Pour the batter into the prepared pan. Bake the cake for 30 minutes, or until it tests done. (You'll smell the chocolate aroma, and the cake will begin to pull away from the edge of the pan). Remove from the oven and cool on a rack. 6) To make the filling: Place the cocoa, chips, salt, and heavy cream in a microwave-safe bowl. Heat until the cream is very hot, and the chips have softened. Remove from the heat, and stir till the chips are melted and the mixture is smooth, reheating briefly if necessary. Stir in the vanilla, and set aside. 7) In a large bowl, beat together the butter, shortening, and half the confectioners' sugar until fluffy. It'll go through a crumbly stage; keep on beating and it'll come together. 8) Add the chocolate mixture, beating till smooth. 9) Scrape the bowl, then add the remaining confectioners' sugar. Beat again until the filling is a fluffy, spreadable texture; adjust the consistency with a little more cream, if necessary. 10) To assemble the cakes: Turn the cooled cake out of the pan, and cut it in half crosswise, to make two 9" x 6 1/2" rectangles. Using a long serrated knife, slice through the middle of each rectangle to make two halves (a top and a bottom) suitable for filling. 11) Spread half the filling on one bottom piece, using your wet fingers to pat/spread it right to the edge of the cake. Repeat with the other bottom piece. Top the bottom pieces with the top pieces. You should now have two chocolate-filled 9" x 6 1/2" cakes. 12) To make the icing: Combine the chocolate chips, corn syrup, vanilla, and heavy cream in a microwave-safe bowl. Microwave until the cream is very hot, and the chips have softened. Stir till the chips have melted and the mixture is smooth, reheating briefly if necessary. 13) Add the confectioners' sugar, or the confectioners' sugar/cocoa, and beat till smooth. 14) Spread the icing evenly over the two cakes. 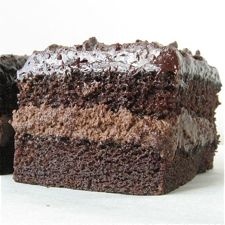 Working with one cake at a time, make two vertical slices and two horizontal slices, to yield nine 2" x 3" snack cakes. Repeat with the remaining cake. 15) Serve immediately. For storage, allow the icing to set, then wrap each cake in plastic wrap individually. Cakes freeze nicely if well-wrapped.